Alistair offers tailor-made courses to suit individuals or small groups of friends, on location in the Jura, around the La Cote vineyards, in local urban areas, at the lakeside, at your home, or in a location of your choice. 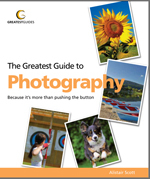 A free signed copy of Alistair’s photography guidebook. Certain specialised items of equipment, such as reflectors, wireless flash controls and individual flash units are available for use during the sessions. Certain lenses (e.g. macro or wide angle) to fit Nikon cameras are also available. The duration of workshops is highly flexible, according to your needs and availability. The minimum length for a course of tuition is 1 hour. A course of this length would typically be for specific advice on using the features of your own camera – any model covered. There is no maximum length – courses can be half a day, 1 day, a weekend, or longer, depending on your needs. Basic rate: CHF100 per hour, plus transport costs outside the Nyon/Rolle area. Use of equipment is charged extra. Alistair can also work with you online, providing advice and photo-critiquing. Rates negotiable. Email Alistair for further information or requests. Thanks for your interest Christina. I have sent you an email. Thanks for your query Anna. I can certainly give tuition in those areas, and I have replied to you by email as that is a more convenient means of communication.